Anxiety Has No Place with Jesus Around! What a comforting verse! I need to be reminded of that Truth all too often. Every opportunity for worry is an opportunity for prayer and thanksgiving before the Lord! With great regularity, it seems, we worry about things that we cannot control. Our mind returns again and again to all the things that could go wrong, rather than turn to our Lord and ask His intervention and peace. Consider Mary, Jesus’ mother, as we see her at that wedding in Cana in John chapter 2. What an opportunity for anxiety she was faced with – they ran out of wine at the wedding celebration! How easily she could have started to fret and panic. Thankfully, she didn’t! She knew just what to do. She simply turned to her son, our Lord, and said to him, “they have no more wine.” She presented her requests to God. Then she simply trusted Him to work things out – “Do whatever He tells you,” she instructed the servants. With confidence and faith, she released the problem to Jesus. It’s as if she knew that anxiety had no place in her heart with Jesus around! But wasn’t it too easy for her? – Jesus was right there with her! Certainly if we had Jesus right with us we would ask Him to intervene! …. Blessings to you this Memorial Day weekend! May you have a restful time of celebration as we join together in remembering those who have sacrificed for our freedom. – Pastor Augie. What a mystery! We are trying to comprehend the PRE-EXISTENT WORD of God … the “Logos” which was present when God “spoke” (i.e. “Word”) the universe into being! How does one understand something that exists before and outside of time and space, when all we know and observe is bound by time and space?! Then further try to comprehend how that pre-existent, eternal, immortal and all-powerful Word allowed himself to be born in the flesh – born of a woman – then raised, taught to eat, walk and speak! How can one explain that? We can’t. It is simply incomprehensible! And yet, that is how the Bible describes Jesus – The Word made flesh. When we look at Jesus, we literally behold the Father’s grace, glory and truth! How thankful are we that God has chosen to reveal himself to us in Jesus – the Word of God! Praise the Lord, Amen! The church is not an organization. It is more like an organism with living parts that must move and work together as a whole. An individual part cannot function on its own. We can readily agree with this assessment. We know that together we can accomplish more than we can alone. But it can be so challenging to work together! Sometimes it seems easier to just “do it myself” than to go through the trouble to create a team environment. 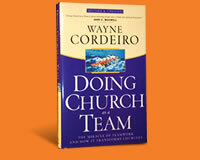 So how do we allow such a team culture and mindset to flourish at our church? I’d love to hear your thoughts on the matter. Please share your comments below! He alone is our HOPE! Spend some time today and try to put into words what this hope means to you … in case someone were to ask you why you believe, and why you have hope! Observation: Earlier in 2 Samuel 6, we see that David chose special men from all of Israel to go and bring up the ark of God. The ark was special. David knew this. That’s why he chose select men! That’s why he lamented that the ark had not been inquired of during the reign of Saul (1 Chr. 13). That’s why we are reminded in 2 Sam 6:2 that the Ark is called by “THE NAME!” The Bible makes clear that where the Name of the Lord is – there He dwells. The Ark of the Covenant was nothing less than the throne of the living God! All was well … except for a major fault … The ark was never to be carried except by the priests using special poles in the rings on the ark (Exodus 25:13-15)! And yet, David carelessly instructed the men of God to put the ark of God on a cart to bring it home to Jerusalem. That was the mistake. Being on a cart, the ark was less stable, and when a man reached out to hold the ark so it would not fall off the cart – he died. For no one could touch the ark of God. Period. Application: Why was David angry at God? God was only doing what He had promised to do. No one could touch the ark of God and live. Is it perhaps that David was angry at himself for allowing such a careless mistake to happen? Don’t we often do that? We get angry at God for things that we have no right to be angry for. God only acts in Holy and Righteous ways – according to His good and perfect will. This we know. But when God seems to act in a way that we would not, or in a way with which we disapprove, we get angry at God. Perhaps at those times we need to examine ourselves instead? What is our motive? Is it pure and holy? Does it seek God’s glory? What is our knowledge? Do we see all things as God does? Are we not limited in both ability and information? Isn’t it possible that something God does that we are unhappy with is actually something good that brings God glory? The truth is, often we are angry at God, simply because we are ignorant. And we are selfish enough to blame God for our ignorance. Prayer: Lord, help me today to recognize that you always act in holy and righteous ways. Help me to examine my heart rather than be angry at you. In your holy Name. Amen!